Favoured by rock stars and society’s crème de la crème, free from peeping eyes and flash bulbs, The Cliff is an exquisite, five-star, 3-bedroomed villa offering 24-hour butler service, gourmet food, a choice of swimming pools, a spa, and a jaw-dropping view limited only by the curvature of the earth. 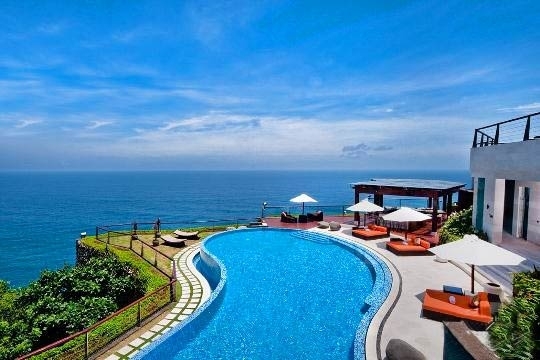 Unobtrusively integrated into the edge of Bali’s southernmost cliff, and blessed with an intoxicating view of the Indian Ocean, is a three-bedroom property appropriately named ‘The Cliff’. This is one of three villas set within a hidden and seriously exclusive enclave collectively known as ‘The edge’ (the other two villas being The Mood and The View). The property fuses its astonishing location with chic contemporary architecture, sleek structures, crisp lines and an abundance of light, harmonised with exceptional interiors, top-of-the-range luxury, cutting-edge facilities, exemplary service and absolute privacy. The Cliff presents two swimming pools, a living and dining room with integrated bar, a fully equipped office, a kitchen, an outdoor dining pavilion, and three bedrooms, one of which is situated in ‘The Villa’ – a self-contained honeymooners’ heaven, which can be rented separately on the proviso that the other two bedrooms are unoccupied and locked. Nothing will prepare you for the view from The Cliff. Here, amid the rocky splendour of Bali’s Bukit Peninsula, the spirit and raw beauty of an extraordinary seascape will soak into your bones. It is easy to understand why the breaking waves are called white horses, especially when they are observed from this lofty perch, suddenly appearing way out to sea and racing in towards the land with their white tails and manes streaming behind them in the wind. And speaking of wildlife, when the waves are calm and the tide is full, turtles, and maybe a dugong, can be seen swimming in the crystal waters close to the shore. If you are really lucky you might even spot a migrating whale, and you can’t miss the long-tailed macaques – the monkeys that inhabit the neighbouring valley. At The Cliff at The edge, fresh seafood, Asian delicacies, as well as Mediterranean and European dishes are tailor-made to suit guests’ preferences, under the gourmet guidance of the executive chef, and served by two personal butlers. 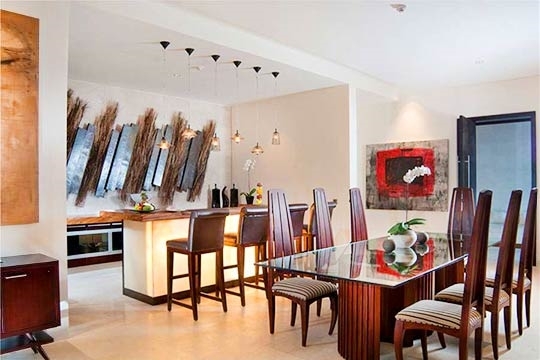 Indeed, this is a property that shows its stripes with easy professionalism and unfailing quality. A sedate remove from the hustle and bustle of the island’s crowded shops and nightclubs; The edge beckons you to The Cliff where the magic of Bali endures. 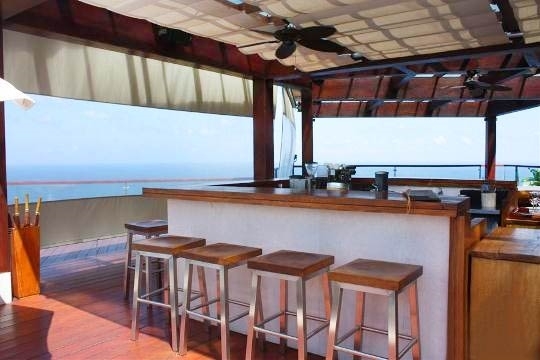 From the top-notch luxury, state-of-the-art facilities, impeccable service, privacy, and – of course – the view, everything about The Cliff (and indeed The edge) proved to be perfect. The dedicated 24-hour personal butlers have all undergone extensive training at Magnum, one of the foremost butler training schools in the world. Whether it was a drink or a sandwich, an extension cable or an adaptor, the butlers anticipated our every need, yet they were so discreet we hardly noticed they were there. Be sure to make at least one visit to the amazing spa: the floor is covered in three inches of water and the treatment beds seem to float between the sea and the sky behind the billowing white curtains that surround it. The views and the abject luxury rate pretty highly by international standards. There is nothing here that you could possibly want for and nothing is too much trouble. In the master bathroom there is even a toilet with an automatic lid that opens to greet you and a seat to keep you warm. If the main villa, The View, is occupied by guests from another group you will not have access to the stunning home cinema or play room. That said, the audio-visual facilities in The Cliff are more than adequate to sate the most fervent movie buffs. Oh, and there will be monkeys! 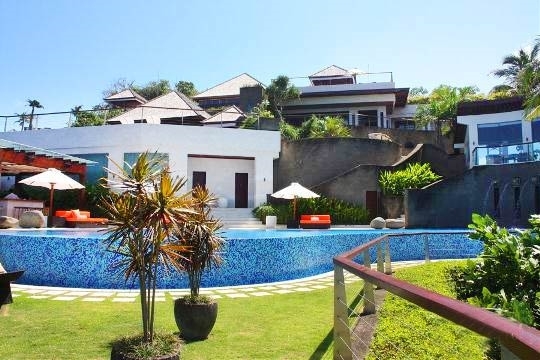 There is simply nothing in the immediate vicinity apart from the truly exceptional view, an undescendable cliff, the vast Indian Ocean, and a couple of local shops selling cigarettes, cold drinks and instant noodles, but the villa is so self-contained it matters not a jot. 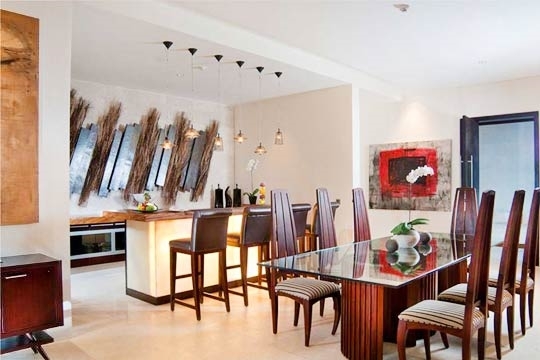 The closest neighbour is the Bulgari Resort (700m) with two fine-dining restaurants. The Bukit (which means 'hill' in Indonesian) is a 140-square-kilometre rugged limestone peninsula that dangles like a pendant upon a chain at the southern tip of Bali. Until recently, this windswept outcrop - revered by the Balinese who have built a series of temples around its perimeter, including the spectacular Pura Luhur Uluwatu - was home solely to seaweed farmers, fisherman and die-hard surfers. In recent years, however, it has reinvented itself to become the most upmarket destination on the island. 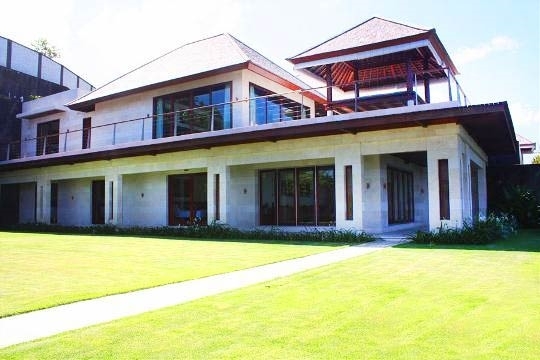 The Bukit now boasts some of Bali’s most opulent destination villas, glamorous private estates, internationally-branded boutique hotels, and ‘One of Asia's 5 Best Golf Courses’ according to Fortune Magazine, making it the area of choice for discerning travellers and residents. Most development has taken place along the isthmus connecting The Bukit to the rest of Bali, with the beautiful sunsets and sandy beaches of Jimbaran to the west and Benoa Harbour to the east. Further along the coast to the east, are a string of resorts and hotels set along the pretty swimming beaches of Nusa Dua. Despite recent development, The Bukit remains sparsely populated and has retained a desolate beauty. Its turquoise waters are the playground of migrating whales, and when the waves are calm and the tide is full, turtles and dugongs can be seen swimming close to the shore. The rocky landscape is dotted with wild flowers, manioc, prickly pear cactus, scarlet flowering flamboyants and fascinating kapok trees. The Bukit is also home to some of the most idyllic beaches in Bali; hidden sandy coves – a dream for both surfers and non-surfers alike (although not always safe for swimming). Even in the rainy season The Bukit is a reliable sun-trap. Bali is Indonesia’s most popular tourist location and is considered one of Asia's premier tropical island destinations. Steeped in history and renowned for its artistic way of life, Bali is a peaceful contrast to some of the more frantic destinations Asia has to offer. The inner peace and creative talents of the Balinese has attracted artists the world over fascinated by local dancers, silversmiths, wood carvers, potters and painters that seem to pervade throughout the island. The abundant verdant fields and surrounding sea have long supplied Bali with an easy surplus of food leaving time for life’s more artistic past times. As a result everything in Bali has a creative and religious element centred around the local Banjar (residents association) – little, adorned temples are everywhere, doors are covered in intricate carvings, huge kites ward off evil spirits and colourful roadside ceremonies bring traffic to a standstill. Bali is a popular destination principally from Australia and Asia but also from all over Europe. The island welcomes thousands of visitors each year to a relaxing lifestyle, stunning beaches, world class surf, vibrant villages, and spectacular scenery all with an exquisite tropical climate. Located approximately two hours’ flying time from Singapore the island is serviced by an international airport at Denpasar with direct flights to and from many major cities in Asia, Europe and Australia and many more via Jakarta, Indonesia’s capital. The island offers an impressive range of leisure and lifestyle amenities including world-class golf courses, wonderful seascapes for surfing, diving and snorkelling as well as luxurious spas, chic boutiques, tropical forests, towering volcanoes and international cuisine. The Cliff is a three-bedroomed villa linked to five-bedroomed The View by two doors with a passage way in between incorporating the wine cellar and cigar lounge. The main building presents an open-plan living and dining room whose sitting area is furnished with a comfy sofa and chairs and equipped with the latest technology entertainment system including Apple TV. 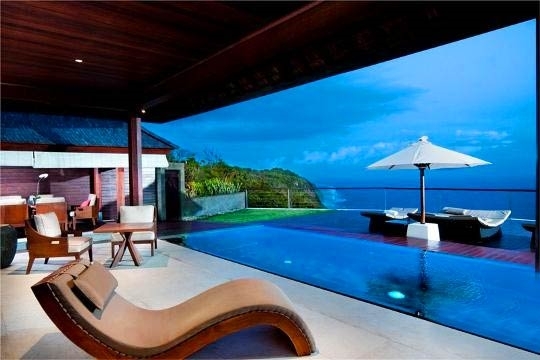 Glass doors open to a lawn and terrace against a backdrop of the ocean. The dining area is furnished with a glass-topped table and eight grand chairs, next to which is a teak-topped bar. A small, self-contained, fully equipped kitchen rests to one side, while a cosy, air-conditioned library/office is furnished with a modern desk and leather chair, a lazy chair, a computer, printer and fax, and a TV with DVD player. The two bedrooms on this level are both blessed with awesome sea views. Each has a king-size bed, and an elegant ensuite marble bathroom with an indoor and outdoor rain shower, and a jacuzzi tub next to a sliding wall panel that opens to the bedroom. Both have direct access to the swimming pool and pool deck via a wrap-around terrace. A marble stairway off the terrace leads down to the third (master) bedroom – actually a self-contained one-bedroomed dwelling known as The Villa – which can be rented separately. 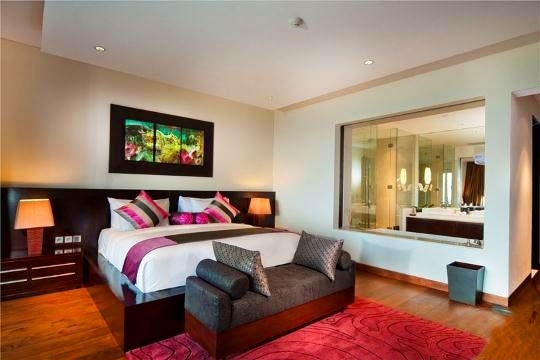 This is honeymoon heaven; a huge bedroom with a king bed, TV and DVD player, windows on two sides looking out over the view, and an ensuite marble bathroom with a Teuco shower with massage jets, a Toto electronically-controlled toilet, and a jacuzzi tub. The bedroom opens directly to a stone terrace and adjacent to this is a sheltered outdoor dining area with a table for six and a small swimming pool surrounded by a spacious lawn and an edge-of-the-cliff timber deck, furnished with sunloungers and umbrellas. There is just no escaping that fantastic sea view! 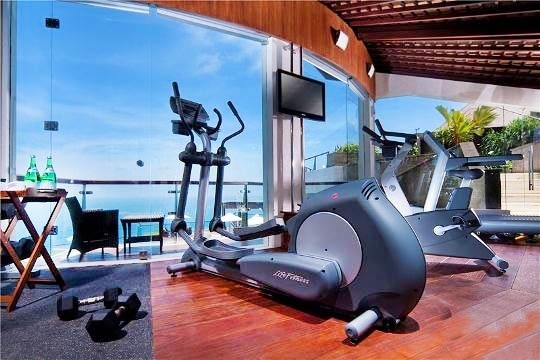 Guests at The Cliff also have full use of the estate's communal facilities which include a fully equipped gym, a spa and cliff-top restaurant and bar, all situated around the communal pool. Please click here for the terms and conditions. - For rentals beginning more than 60 days after the date of your booking request - a deposit of 50% of the total rental amount is payable. - For rentals beginning 60 days or less after the date of your booking request - the total rental amount is payable as a deposit. In the event of cancellation, penalties as outlined in The Villa Guide Booking Terms and Conditions apply unless special conditions are indicated for the period you are booking. It is strongly recommended that you purchase trip cancellation travel insurance. Above prices may change based on the time of your booking, arrival date and length of stay. For approximate rates, please click on the Check Availability button and enter your dates. Whilst every effort is made to keep rates current, they are subject to change from time to time. If there is a rate change you will be informed before a booking is confirmed. Confirmed booking rates will not change. Upon arrival at the villa you may be required to pay a security deposit. Any applicable deposit will be returned to you prior to departure less any extra charges or costs for accidental damage to the property. Late check outs up to 6.00pm may incur a half day charge, after 6.00pm a full day may be charged. Every effort will be made to accommodate other check in/out times but will depend on availability. The Villa Guide full Booking Terms and Conditions are available here. 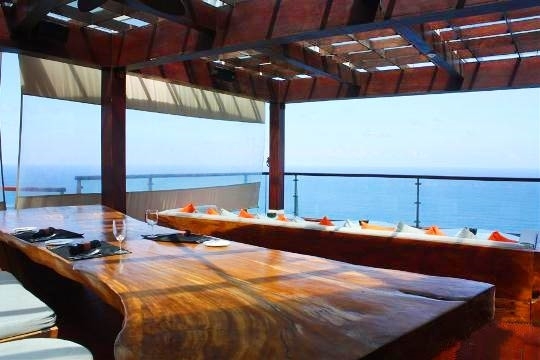 Built to resemble a yacht, this semi-circular dining room perches 85m above the surf and boasts spectacular sea views. Dine on a Mediterranean menu featuring the freshest produce from the sea. Situated on a pristine stretch of white-sand beach down an inclinator from the hotel, this stylish beach club serves up ocean-fresh seafood, pizzas, salads and cocktails from morning ‘til night. At a spectacular setting on the cliff edge, Il Ristorante serves dazzling modern interpretations of classical Italian cuisine, blending imported ingredients with Bali’s organically grown produce. Try the saffron risotto with Balinese five spice seasoned ocean scallops and organic asparagus. 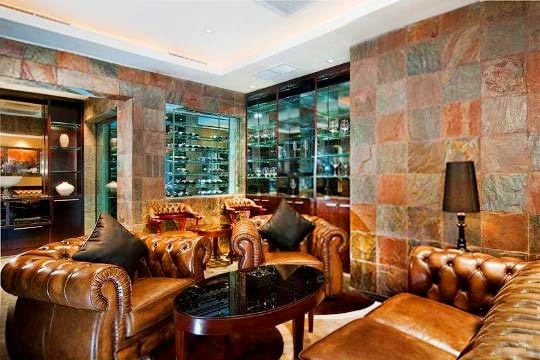 The menu is complemented by a collection of Barolos and some of Italy’s finest wines. Open only for dinner. Named after an Indonesian rooster cage, Sangkar is stunningly lit with traditional bamboo caged lamps, and incorporates outdoor spaces and eye-boggling views of the Indian Ocean. The menu combines traditional recipes of Indonesia and Bali with modern culinary techniques and presentations. All day dining, children’s menu available. Robinson Crusoe-inspired beach-hut grill half way down the cliff (accessed via an inclinator) overlooking the crashing waves below. Serves fresh grilled seafood and the Bulgari’s renowned Herbojito cocktail. Open 10am to 5pm. 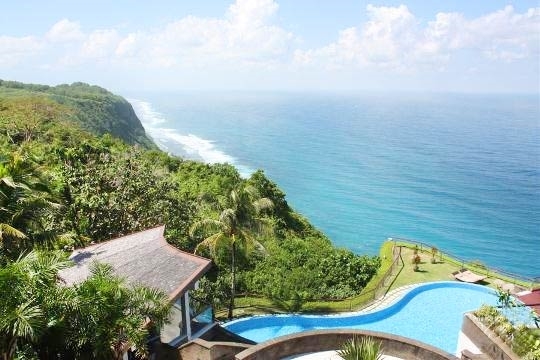 It will cost you a lot more to eat authentic Indonesian and Balinese cuisine here than at a local warung, but it’s worth it for the dramatic view of the cliff and Indian Ocean. Balinese signature dishes include ‘Sate Lilit’ on lemon grass skewers’ and ‘Ayam Betutu’ – chicken baked in banana leaves – served with choice of red, white or yellow rice. Upscale gastronomic energy greets guests at Ju-ma-na, Banyan Tree Ungasan's signature restaurant, where walls of glass are bordered by a cliff-hanging terrace and an intoxicating view of the Indian Ocean. The menu introduces plenty of seafood and natural ingredients, a ‘must have’ is the Lobster Cappuccino. Open only for dinner. This coffee shop in the village close to the Nirmala Supermarket sells freshly baked breads and pastries, and serves up excellent salads. Located at Blue Point Villas & Spa (a popular Japanese wedding venue) it’s not so much about the food at this restaurant but the view! You will be mesmerised by the surfers riding the waves below. Stylish bar overlooking the Uluwatu waves. One of the most happening scenes in Uluwatu, this is the place to head for sunset and hang till late. A killer, modern surf bar with a pinch of laid back cool on the cliff at Uluwatu overlooking one of the world's most iconic and prestigious surf spots. Watch the perfect waves with a cold Bintang in your hand, kick back, relax, relish the sunset, nibble on a pizza, sip a frozen margarita and bop with the band. 'Sunday Sunset Sessions' hosting live bands and DJ's. Supermarket with swimming pool, food court and snack corner plus a Dream Zone on the upper floor. This is the best supermarket in the area; it sells all the basic but not a great range of imported products. This is the only Bulgari shop in Bali, sells jewellery, watches, accessories and fragrances of the brand as well as the special gift collection from Bulgari Hotels & Resorts. A ‘Surf Shop' is attached to this cafe and bar, stocked with his and hers clothing, books, photos and surfing memorabilia. Padang Padang, with its 500m stretch of sand, rock pools at low tide and a bamboo shack selling drinks, is a popular surfing beach. It’s archetypically enchanting and nestled in a pocket of lava-rocks. This strip of sand is popular with surfers who come for its ripping reef break. June to August gets busy, and there are a few warungs dotted along the sand. This is a famous surfing Mecca due to its world-class breaks. It is worth venturing down the Cliffside to Suluban Beach’s rolling surf, which is best at low tide. Access is through a coral reef cave. Situated between Padang Padang and Dreamland beaches, this white-sand strand is difficult to access (down the cliff side) but rewards with sensational sea views. Uluwatu’s world-class reef break, with its famous entry cave, is a Mecca for surfers. Down a series of steep steps, the beach is accessible at low tide, but it’s not safe to swim here. Above the beach is a jumbled collection of cliff-edge warungs (eateries) and surfer hangouts. This is a great spot to enjoy one of Bali’s legendary sunsets, while watching the experts riding the waves at Suluban Point. This ancient temple is balanced on the very edge of a narrow rocky cape, and is particularly sacred to fishermen, who come here to pray to the sea goddess, Dewi Laut. Legend has it that the temple is actually a ship turned to stone and for sure, the grey volcanic rock, glowing with the radiant colours of the setting sun, will leave you with a lasting and haunting memory of spiritual Bali. A Kecak Dance performance takes place in the temple amphitheatre daily at 6pm against a backdrop of the setting sun. Probably the best known of the many Balinese dances, the Kecak is a spectacular choreographic performance that involves a chorus of men who provide a non-stop hypnotic vocal chant – Cak-Cak-Cak-Cak – to a core episode of the Hindu epic, the Ramayana. Feel the adrenaline rush at Paintball Bali by participating in an adventure team sport like no other. The three-hectare compound with three independently themed courses features the latest imported equipment from the US. The only surf school on The Bukit. Most lessons take place at Dreamland or Padang Padang, with the options of Uluwatu and Balangan depending on ability and the conditions on the day. Internationally-qualified instructors will address your specific ability irrespective of whether you are a complete beginner, intermediate or advanced. Experience hot volcanic stone therapy, body wraps, Ayurvedic-inspired remedies, intense facials, stress recovery, jet lag revival and detoxifying cleansing rituals complemented by rainshowers, plunge pools, aromatic steam rooms, an open air relaxation lounge and a yoga pavilion. Offers “treatments from the heart”, in which it blends ancient Asian healing techniques with age-old beauty recipes that harvest the curative benefits of fresh, natural, quality ingredients. Check out the Man Facial and the Herbal Compress. The menu even includes a Pregnancy Massage. 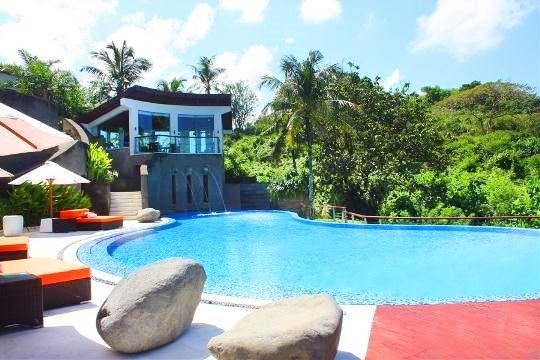 3 bedroom villa located in The Bukit, Bali. Ideal for Beach in ten, Bring the relatives, Kid friendly, Gastronomic delights, Going for golf, Fair share for groups, The great outdoors, Romantic retreats, Spa sensation, Sensible for seniors, Room with a view, Perfect for weddings. 9 out of 10 based on 1 user reviews.